Bored of salads and fruits as snacks? Try these! Having only salads, sprouts, fruits and other similar food as snacks can become monotonous and boring after a while. 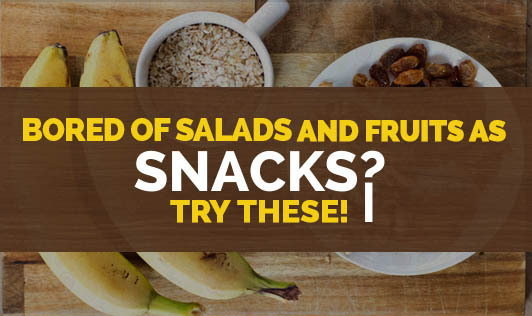 Try these simple recipes to make your snacks exciting! • Mix all the ingredients. • On a greased baking tray, place a spoonful of the mixture and bake it for 5 minutes at 180°C. • Toast the bread slices until they turn golden brown on both sides. Keep aside. • Scoop out avocado pulp into a small bowl and mash it well to make a fine paste. • Spread the mixture on the toasted bread slices and serve. • Slice the banana and freeze it for 2 hours. • Grind frozen banana and peanut butter until the mixture turns soft. • Soak soya nuggets in hot water for 10 to 15 minutes. Strain the water and squeeze off the remaining water from the chunks. Repeat this twice. • In a pan, heat oil and add salt, chili powder, and garam masala. • Add soya nuggets and mix till the masala is well distributed. • Let it cool down and serve.